An emergency in the workplace can be defined as an unexpected event that threatens the physical and mental well-being of employees and visitors. Emergencies can come in many forms and include the following natural and manmade threats. 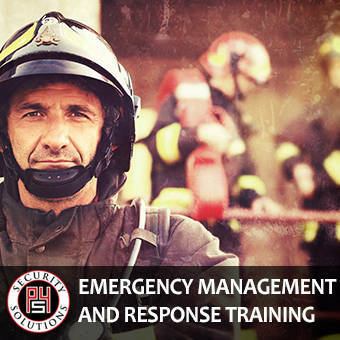 Our team will guide you through the process of selecting the right people to train in your organization to lead an emergency response effort should there ever be a need. Our comprehensive training sessions address these critically important topics. Proactive awareness for the potential of an emergency. Developing a formal evacuation plan. When and how to evacuate. Determining when it is best to stay in place. Working with disabled or other impaired employees. Regardless of industry or the size of your company, the professionals at P4 Security Solutions can develop an effective and custom fit emergency response program to ensure that your employees are protected during potentially harmful situations. Contact us today to learn more about how we can put our decades of experience to work in your organization with our emergency management training classes.